Choreographer Alexei Ratmansky re-stages Les Flammes de Paris, a ballet which had its hour of glory in the Russia of the thirties, into a 2008 version giving the principal roles added weight and largely reinventing the original choreography. The Flames of Paris, is a ballet that evokes memories of dancers who were products of a certain school of Russian ballet training. Likewise for the music of the Pas de deux of Jeanne and Phillipe in Act ll, which supposedly accompanied bar exercises. This technical virtuosity was what won dancers enthusiastic applause wherever they produced, and so ballets were programmed as vehicles for star dancers to demonstrate their brilliance. Even The Classical Ballet of Moscow was not exempt . . . However, The Flames of Paris cannot simply be categorized as a brilliant Pas de deux. Created for the Bolchoi in 1932 by the choreographer Vasily Vaynonen, it is perhaps the first overtly political ballet ever. Soviet spectators identified with the French Revolution-inspired theme as a forerunner of their own recent revolution. The music by Boris Asafiev, a reputed theorist who also wrote the lovely music for the ballet La Fountain de Bakhtchisarai, is a carefully constructed orchestral work influenced by French Revolutionary tunes and classical music, accompanied by a heavy brass and percussion section, appropriate for heroic choreography, and something rarely seen in ballet, some of the revolutionary songs are actually sung on stage. . . The new choreography by Alexie Ratmansky, ex-director of the Bolchoi Ballet, retains a certain number of passages from the original choreography created by Vasily Vaynonen, among which the famous Pas de deux, and includes a large section of the entertainment ballet, Rinaldo and Armide, a sort of court ballet within a ballet. 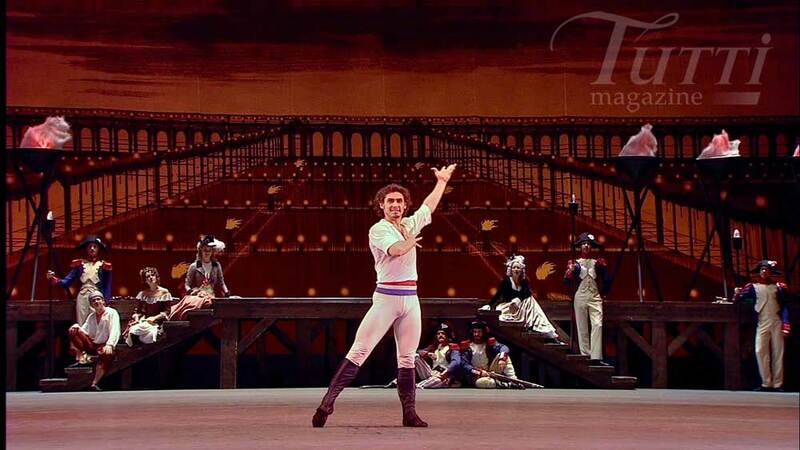 Some of the passages of the ballet were re-adapted from original choreography, while others imitate Vaynonen’s style. Ratmansky himself readily admitted in the bonus section of the DVD how difficult it was for him to follow in Vaynonen’s footsteps. It is interesting to note that the booklet accompanying the DVD cites the name of the choreographer for each scene. This version is technically more demanding than the original and places a greater stress on the unfolding drama: two newly-formed couples whose destinies unfold with the changing fortunes of the French Revolution. The tragic bloody ending will come as a surprise to many a spectator. Despite its powerful storyline, the ballet lacks a certain clarity, and the presence of vast numbers of dancers on stage does not make it easy to keep track of the action. Alexie Ratmansksy admits frankly that spectators and dancers may not find his version of The Flames de Paris totally convincing, attributing this attitude to a lingering fondness for Vaynonen’s creation. Director Vincent Bataillon deserves full praise for this March 2010 production. Aside from an anomalous Moscow scene of a tourist site and a busy shopping street at the beginning of the program, instead of a “revolutionary” scene that one would expect to find, the stage-settings are ideal. Unlike some of Ratmansky’s colleagues who have a tendency to keep the dancers on a tight leash as it were, here they are given space to let go, much to the spectators ‘enjoyment. Of the soloists who appear on stage, Natalia Osipova stands out brilliantly in the role of Jeanne. Her grace, energy, charm and precision in executing extremely difficult movements makes her one of the highlights of the ballet. A natural actor, she is equally convincing in sentimental situations, as she is while rejecting Marquis Costa de Beauregard’s advances. Whether dancing in toe-shoes, or in costume shoes for the “popular” dances, her vitality shows through her every move. Natalia Osipova is a superb artist who dances effortlessly, generously and in keeping with the musical spirit. The impression she gives is of a dancer who having reached a certain level of trust in her partners, has no hesitation executing those fast perilous ‘portées. Theatricality is the very stuff of Alexie Ratmansky’s stagecraft. The action scenes are well thought out, as are the scenes of dramatic tension. For example when Jerome comes to his sister’s defense in rebuffing the Marquis, his burst of energy is just right. Dennis Savin incarnates the role of the young man with genuine convictions. 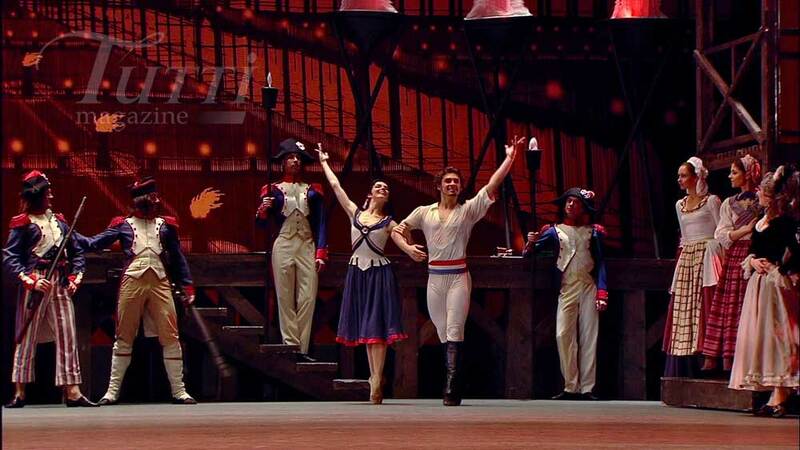 His stage manners, as well as those of Osipova evoke “Bolshoi”. Their gestures are powerful and dramatically coherent. The brother/sister couple functions very well. Savin’s aerial leaps are breathtaking. As with his partner, this reservoir of primal energy is what this huge stage demands. 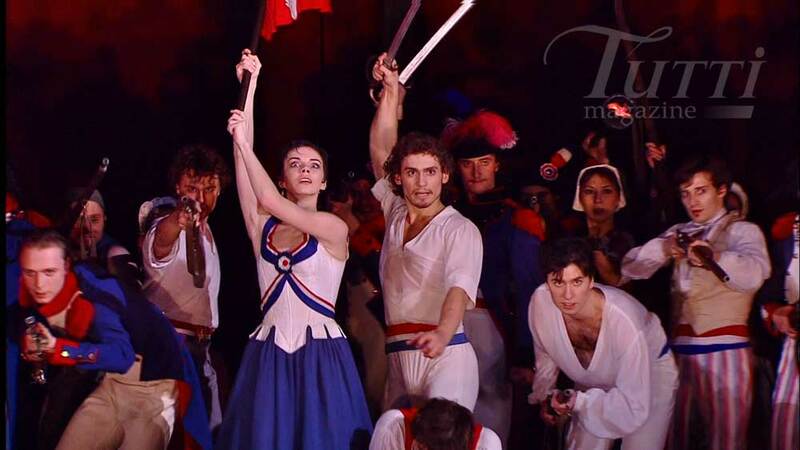 In Scene l of Act l, the whole ballet troupe surrounding the soloists is involved in what is essentially a dance of popular origin and the spectator has little trouble in identifying them as the Marseillais. Scene 2 Act l, in an abrupt break, takes place at the Palais Royal in Paris. The Marquis and his daughter Adeline, who Jerome is in love with ever since she saved him from an embarrassing situation, have just arrived in the middle of Rinaldo and Armide, a court entertainment. A pretty backdrop is lowered from the ceiling to set the stage for Anna Antonicheva, dancing the role of the actress Mireille de Poitiers, followed shortly by Ruslan Skvortsov taking the role of Antoine Mistral. These two elegant and powerful dancers represent a certain idea of classical ballet along with pretty costumes. Music from the Ancien Régime is heard in the distance in clashing contrast to the din of “popular” music. These two dancers are a study of Grace and Elegance in the poses they strike. Meanwhile a bouncing Cherubim (Yekaterina Krysanova) triggers their love. It is during this comic interlude that we discover the most classical aspects of Vaynonen’s choreography. The variations serve to demonstrate the dancers’ technique: control, balance and precision underlying the beauty of their movements. The dynamic incursion of the Furies, choreographed by Ratmansky, enlivens the end of the scene with a burst of energy just before the interval. However, Scene 2 is a little over long. Near the end of the scene Louis XVI and Marie Antoinette appear on stage. The sight of the king hopping about idiotically in circles and his courtiers imitating him, leaves one perplexed. This jumping about is hardly royal comportment, and is more characteristic of the peasant mode of dancing under the monarchy. The Nobles hearing faint sounds of the Marseillaise rising in the distance feel uneasy. Adeline flees . 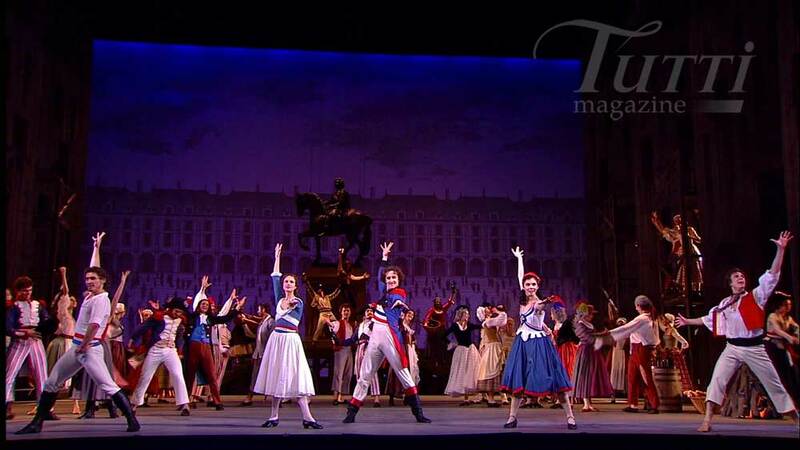 . .
At the start of Act II we encounter the Marseillais volunteers again at the entrance to the Tuileries. Natalia Osipova is now in costume shoes instead of toe-shoes. What you notice immediately is her ease at doing popular dances, seemingly unaffected by her inexperience in folk dancing mentioned in the bonus. Where classical dance requires performing continuously off the ground, the choreographer here has the dancers’ feet planted firmly on the ground in long dramatic scenes. This poses no handicap to Natalia Osipova, whose dynamic movements and speed of execution leave one speechless. What a dancer! Adeline, who is in love with Jerome, meets him again. While the crowds are drinking and getting intoxicated, several brilliantly executed character-dances follow. A rhythmic Auvergnat folk dance choreographed by Ratmansky hits the mark, followed by the Marseille folk dance involving a trio who do strenuous and virile pirouettes, and grand sauts from the second position. Vynonen’s choreographic signature is very noticeable in the Basque dance. Denis Savin and Ivan Vassiliev, who plays a hot headed sans culottes from Marseille, in love with Savin’s sister, whom we encountered in Act l, are terrific putting on this demonstration which requires both strength and total commitment at each movement. Natalia Osipova joins them and the trio explode in a burst of energy which has it equal only in the percussion section of the orchestra recorded on the 5.1 Dolby stereo sound track. This Basque Dance finishes with five dancers in perfect synchronization. What an applause they receive from the Bolchoi public. Let's join them! Though Ivan Vassiliev was excellent till now, from this point on the ballet becomes his showcase. Vassiliev does not miss a turn to exhibit his strength, precision and his ability to make soaring grands jétés. The Caramagnole gives the dancer a pretext to launch a series of extended leaps diagonally across the stage which make you think immediately of the choreographic enchainements of Yuri Grigorovich for Sparticus. The sheer elevation of his leaps leaves you flabbergasted. Adeline and Jerome’s romantic pas de deux precedes their rupture, but you sense it coming. Here you get to appreciate the qualities of Nina Kaptsova: we feel her inner tension, her delicate arm movements and her musicality. We identify with her, the character comes to life. Her destiny which unfolds in the final scene is going to be cruel. The Marseillais mob break into the Tuileries Palace by force, the members of the National Convention and members of the New Government arrive at the scene. The dancers who were in the comic interlude Rinaldo et Armide, now incarnate the values of liberty. The couple stand out for their grace amidst other dancing couples. Assafilev’s score wonderfully captures this special moment. These two Flammes de Paris offer a superb pas de deux , generous and ample in every sense. Jeanne and Philippe are united in matrimony by the President of the Convention. This precedes the emblematic pas de deux, which having survived years of neglect and oblivion, finally gets deserved recognition. Could it be anything but normal that the public show their appreciation at this tale of heroic courage? Natalia Osipova herself is partly a reason for this success. In addition to the qualities already mentioned, her pirouettes are extraordinarily fast. 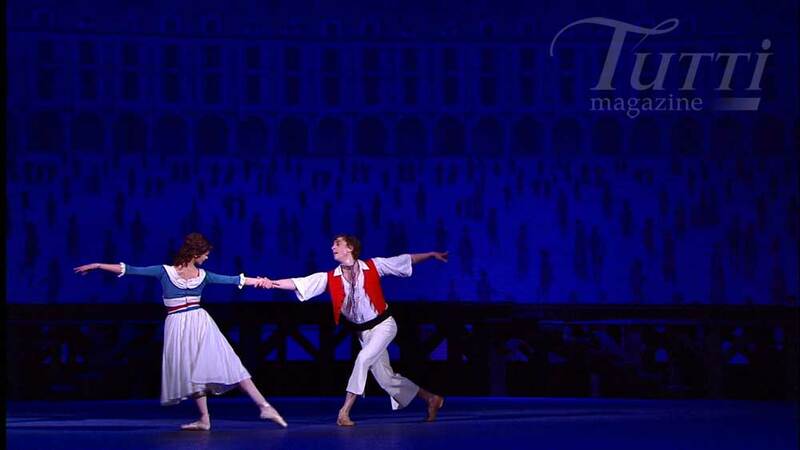 In the variations de Philippe, she makes Ivan Vassiliev leap and stay airborne far longer than his toes touch ground. These Grands sauts are notoriously dangerous at reception: there was a blood smudge on Vasiliev’s white trousers when he reappears on stage to take his bows.. The Variation of Jeanne, danced with a watchmaker’s precision is feminist in inspiration. The supercharged Coda too is filled with fouettés and other ballet steps that are a pleasure to watch. Les Flammes de Paris has a totally melodramatic ending whose principal character is a formidable Guillotine which hovers in the background. The action accelerates at astonishing speed: The Marquis is guillotined. Jeanne and Phillipe hold back Adeline but she throws herself at her father’s body even while the celebrations erupt, just before being recognized by Jarcasse (Yuliana Malkhasyants), son of the Marquis. Adeline is guillotined in turn in front of Jerome who is overwhelmed with grief. The mob marches to the front of the stage in measured steps. Jeanne and Philippe walking in their midst look dazed, with Jerome lying on the ground in tears, holding the Marquis’ head in his hands. Frankly, this ending leaves one cold. But it also shows a plot lacunae, because there is no previous hint of the violence to follow. The spectator’s uneasiness is not due so much to the blood-letting, which really did take place historically, but at the premature demise of characters who had just barely time to exist. However, this impression should not diminish the ballet’s main attraction: its fieriness, energy and the technical virtuosity of the dancers and also the obvious pleasure of witnessing a beautiful production. The ballet must surely have touched the hearts of the Bolchoi public for them to give the company and its soloists, still panting from their effort, such warm applause at the end. High definition in English and Russian (subtitles are not accessible during viewing) - French and English and German. - Revealingly frank interviews. The choreographer explains his reasons for restaging the ballet so as to furnish the company’s repertory a ballet associated with its debut, distinguishing it from its rivals, and his wish to give more weight to the plot and his own difficulties in working in Vynonen’s style. It does not take long to realize that the images are indeed in High Definition. When the stage is enveloped in fog at the beginning of the ballet highlighted by the lighting, the dancers in the distance still appear sharply despite the smokescreen in the foreground. Superb contrasts and rich natural colors together with an exceptional depth of field makes it easy on the eyes and viewing a pleasure. There is a problem converting a 50 Hz signal to 60 Hz for worldwide distribution resulting in a slight image instability that crops up occasionally and is sometimes as background image jumping. The stereo track diffusing a relatively uniform sound does make a separation between the brass and percussion section, a very important factor in Asafiev’s orchestration. This explains the depth of the bass sound and the overall dynamic range. Listening on the 5.1 track on the other hand is to experience a wholly different universe: that of a live ballet. The orchestral sections are clearly separate and the brass section at the front of the orchestra is clearly separated from the percussionists at the back of the pit allowing for a controlled resonance, characteristics of a real concert hall which the sound engineer has sought to achieve. The track for the bass sound provides a rich fullness which can only enhance the musical score. The spectator is fully immersed in the music as a result of this dynamic.